Collins Booksellers - MRI "All-In-One" Registry Review by Josh Van Den Bossche, 9781311129598. Buy this book online. 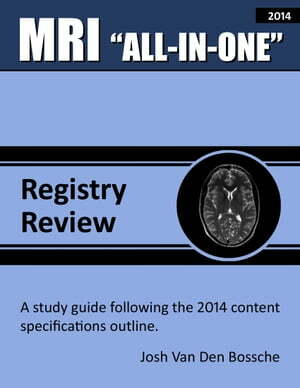 MRI “All-In-One” Registry Review was written to guide today&apos;s students in preparation for the MRI registry examination. Having once been a student myself, I know how overwhelming the process of preparing for the registry examination can be. Many college educators, registry review seminar leaders, and online courses attempt to guide learners through multiple books, countless modules, and hours of PowerPoint lectures and note-taking in order to prepare learners with relevant information needed to successfully pass the MRI registry examination. My goal was to create a MRI registry review with tons of relevant information "all-in-one" place. This MRI study guide follows an outline format extremely similar to the content specifications outline that the ARRT registry examination follows, thus preventing learners from wasting valuable time trying to gather important information, and allowing them to spend their time actually studying for the MRI registry examination. ?Within this detailed outline is a plethora of highly relevant information that has been acquired throughout my college education, extensive registry preparation, and while working within the field. Included in this study guide is a highly organized outline review, as well as multiple highly organized charts (containing important numbers, regulations, equations, and parameters) of which are located throughout the study guide, and then again in a compilation at the end of the guide in order to make the absorption of information as easy as possible.